It is a challenge as a DYI bride to incorporate all three key components into a wedding design: Color, Theme, and Detail. Designers love going over the top - they know how amazing the outcome will be when you embrace more than one design element into your celebration. Most DIY brides have a tendency to be cautious, unsure of what the finished product will look like. The wedding pictured above used wonderfully creative details to incorporate all of these elements. Raspberry and lime green may not be your standard beach colors; however, as you can see, by drawing inspiration from the beautiful seaside location, this wedding has introduced bright colors and beach elements - creating a great cohesive theme. 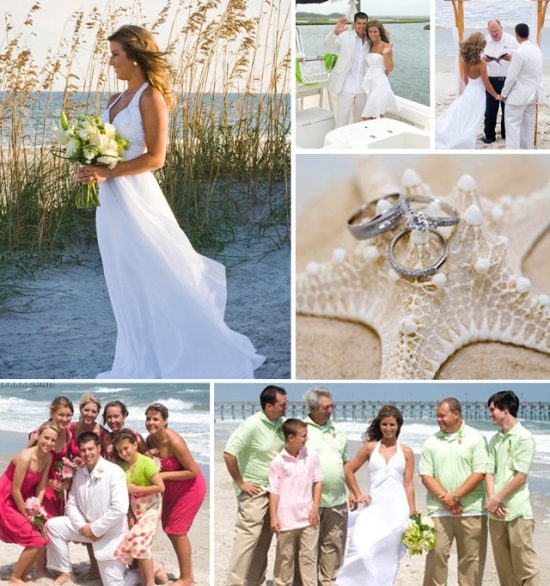 The bride's bouquet carefully incorporates sea grass, orchids, and Gerber daisies. It is elegant and fun all at the same time. The inclusion of the petite starfish and simple flowers to create the boutonniere ties into the theme and creates a memorable one of a kind element. Limes in the vases are a great way to weave the vibrant lime green color into the party and a modern flair into your design. The tent creates a wide open space with a great ocean view; however, it is challenging to keep the tent from looking "stark." The addition of hanging lanterns in raspberry, key lime, and white give the ceiling a reflection and help to minimize the feeling of empty space. Raspberry, lime, and white are a great springtime combination. These powerful colors can be used to augment an already colorful garden setting or they can create a statement in a simple room with neutral colors and simple lines. The Beach Chalet in San Francisco is a great location to incorporate these bright colors and playful theme. The Pavilion By The Bay on Treasure Island with its amazing bay views would also be a fun location to turn into your own personal beach party.